The name Delmonico originally applied to steaks served at New York City’s Delmonico’s Restaurant in the 1800s. Today, you’ll see the name used to label chuck, sirloin and rib cuts, depending on which part of the country you are in. There is no definitive agreement as to what constitutes a Delmonico steak. The contemporary Delmonico’s in New York City uses a rib-eye steak. The grilling method described here works with other cuts as well. Delmonico steak is an excellent source of protein and iron. Although the meat is low in sodium, it is high in saturated fat and cholesterol and should be eaten in moderation. Steaks cook more evenly if you start with the meat at room temperature, so take the Delmonico steaks out of the refrigerator 30 to 60 minutes before you begin grilling. You can marinate the meat or season with herbs, but a Delmonico steak already has excellent flavor, so rubbing a little salt and pepper on each side may be all you need. If you have a gas grill, brush the surface with vegetable oil to keep the meat from sticking. Preheat one side to high and the other to medium heat for 10 to 15 minutes with the cover closed. For a charcoal grill, put a single layer of coals on one side and place most of the coals on the other to create high and medium temperature areas. When a steak is 1 inch or more in thickness, the meat should be seared to seal in the juices and minimize drying. Place the meat on the hot side of the grill for 2 minutes. Turn the steaks over and allow them to cook for 2 more minutes. The meat should be brown in color. Once the steaks are seared, move them to the side of the grill that is preheated to medium heat to continue cooking. Searing is not necessary for steaks less than 1 inch thick, so place them on medium heat to start with. 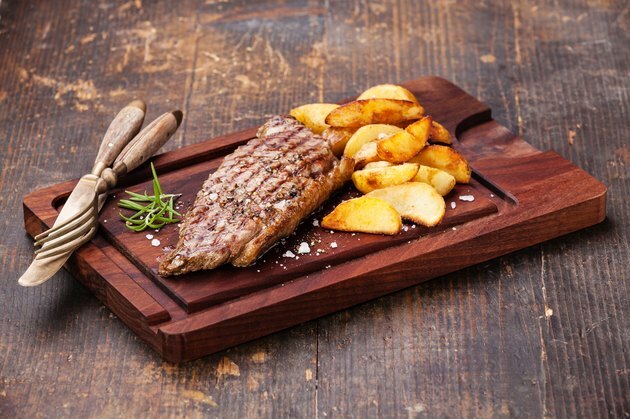 The cooking time for your steaks depends on the thickness of the meat and personal taste. For 1-inch steaks, cook the meat 3 or 4 minutes after searing for rare meat and up to 8 or 9 minutes for well done. A 1 1/2-inch steak will take 2 to 3 minutes longer. These times are estimates. To verify the meat is done to your taste, use a meat thermometer to measure the internal temperature of the meat. A rare steak will be at about 125 to 130 F. Medium rare is 130 to 140 degrees. For medium, you want a temperature of 140 to 150 degrees. Medium well is 150 to 160 degrees, and well done is 160 to 170 degrees. Once your Delmonico steaks are cooked to taste, remove them from the grill and place them on a serving plate. Cover the meat with an aluminum foil tent for 5 minutes. The tent keeps moisture in while the temperature of the meat distributes evenly. Remove the foil and serve.